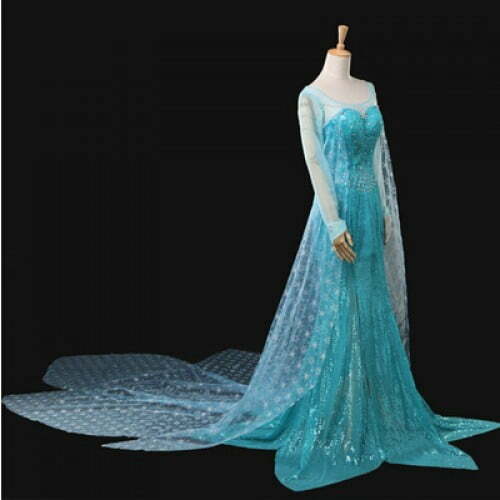 Set yourself aside from commoners wearing Elsa costume from Frozen. When everyone will be transforming themselves into witch & werewolves, we recommend you to steal the show by being a queen. Elsa snow queen from Frozen is a character of elegance and poise. No matter how many ghouls and zombie parade alongside the road in dark; the royal show of the queen cannot be defeated! 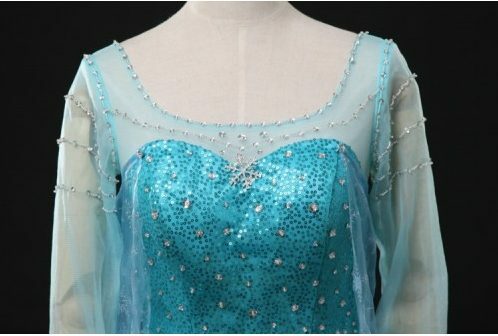 Elsa costume features a jeweled off shoulder bodice in crystal blue with a cape displaying an artistic constellation of snowflakes. Elsa costume bears the same regally ethereal look that you resisted batting eyes at, in the Disney movie Frozen. Costume is dazzled by the sequined fabric which sparkles intensely in sharp flash lights and outdoor sunny/snow shoot. The gown’s bodice is decorated with crystal white rhinestones where the sheer powder blue translucent fabric of the cape allows enough gleaming of the sequined bodice from underneath. The snowflake cameo embedded on the bodice neckline is yet another signature element of the Elsa costume. The paneled shimmery skirt with a long slit at the right knee add a realistic effect to the entire gown & helps turning fantasy into reality. 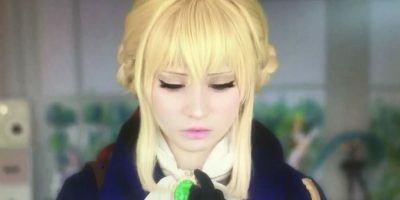 Elsa costume looks magically enchanting when paired with the cosplay Elsa wig. It is loosely braided in French style where you could dramatize it by weaving it with snowflakes incrustations. Don’t forget to keep some wisps loose and open that should rest at your forehead carelessly. The floor sweeping Elsa costume is itself a class and luxury. If dripping blood & changing eye color to wild and beast-y is not your type, try taking a softer side. Pose your style elegantly wearing Elsa costume amongst all frightening faces at Halloween! All Crazy Halloween Lenses available for upto%Discount. Hurry!